Should we have another WordUp Whitehall? Over the last couple of months, numerous people have got in touch to ask if there’s going to be another WordUp Whitehall this year. And although I didn’t initially think it was a good idea, I think I’ve been persuaded. For the past two years, I’ve organised WordUp Whitehall as a kind of ‘WordCamp’ for civil servants who are already using WordPress (or are seriously considering it), and the developers/agencies they’re working with. It’s mostly a series of ‘show and tell’ sessions, aimed at sharing experiences, stimulating ideas and spreading good practice. I also try to persuade a special guest or two to come along. Recognising that it’s a workday event, and that departments have been generous enough to offer conference facilities at no charge, we’ve enforced fairly strict rules of engagement. UK central government only, with limited numbers from each department. Outsiders by invitation only. Guaranteed confidentiality where requested. And no sales pitches. They’ve been beautifully observed, for which I’ve been most grateful. But I wasn’t sure about doing it again this year. Previously, we’ve had a handful of obvious flagship projects for people to come along and present: Health, Transport, No10, GCN, etc. But the past year or more has been dominated by the development of GOVUK, and its imminent consumption of all departmental sites. We simply haven’t had any ‘big bang’ WordPress launches post-GDS. And that made me wonder if we had enough to talk about. I’ve subsequently been persuaded that there’s definitely an appetite for another event… but perhaps a slightly different one. We’ve already been offered a much larger venue than in previous years: so it’s probably the perfect time to extend the event beyond Whitehall – local government, arms-length bodies, perhaps friends overseas. And if we’re short of ‘flagship’ projects to present, maybe it’s time for a slightly different agenda. Perhaps a greater number of shorter presentations, focusing on specific (little) things we’ve all done. I’m not sure the beautiful chaos of a multi-track, self-organising BarCamp / GovCamp style event is quite right, but perhaps it does. Some things won’t change, though. It’ll still be free to attend. It’ll still take place in mid to late Autumn. Most of the ‘rules of engagement’ will still apply. And yes, there will be donuts. So… it’s over to you lot. I’d love to hear what you, the potential attendees, think. What level of interest is there beyond Whitehall? Are there any ‘flagship’ projects I’ve missed somehow? Perhaps beyond Whitehall? Does everyone have a ‘little thing’ they could present? Do we prefer structured or chaotic? Please leave a comment below, and let’s see where the consensus lies. Posted on August 29, 2012 Categories e-government, technologyTags wordupwhitehall8 Comments on Should we have another WordUp Whitehall? Along with much of the European web industry, I spent last week fielding calls from clients, asking whether their site was compliant with the rules – or perhaps more accurately, whether they were facing a £500,000 fine, like they’d heard on the news. As ever with these things, it boiled down to choosing a role model, and copying what they were doing. The Government Digital Service and DCMS (as lead department) were both taking an ‘implied consent’ approach, with pages listing and justifying the use of each individual cookie; and the BBC, initially, were doing likewise. That was good enough for most people. And then, outrageously late in the day – a scorching hot leave-work-early Friday at that, the ICO cracked. Posting on their corporate blog, Dave Evans announced that their guidance had been updated to ‘clarify’ that implicit consent was a valid form of consent, as long as you were ‘satisfied that users understand that their actions will result in cookies being set.’ In other words, implicit consent with appropriate information was absolutely fine. It was the only sensible outcome. Constant popups or warning banners would have killed the concept of cookies, which are used – in the vast majority of cases – to make things easier for users. It would have undermined most websites’ traffic analysis. And besides, with third-party services from sharing to embedding now common on every web page, I’m not convinced any technology could have successfully blocked every attempt to drop cookies anyway. Common sense would seem to have prevailed. Hurrah. But I’m sure a lot of people are less than happy at the ICO’s handling of this. 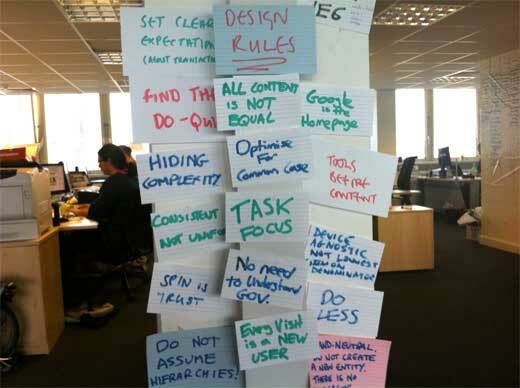 Created by DWP ‘in their role as leaders of Govt agile adoption on the ICT Strategy CIO Delivery Board’, it’s a community site which sets out to provide a space for ‘people in the public and private sectors to discuss, share and get advice and answers on adopting agile in UK Government projects’. As such, it ticks a box from the ICT Strategy Implementation Plan. Naturally I’m delighted to see they’ve built it using BuddyPress. It looks like a fairly ‘vanilla’ installation for the moment, running using the free BuddyPress Corporate theme, with minimal customisation. I’ve also spotted the Q&A premium plugin in there too. The IP address reveals it’s the handiwork of Harry Metcalfe’s DXW crew. They’re doing the right thing by just charging headlong into it; it seems like all the Facebook-esque functionality – personal profiles, groups, forums (? ), friending, etc – has been enabled. Some of it will work, some won’t. But since it’s all in there already, you may as well give it a try. I’d also endorse the decision to work with a ready-made theme: I recently looked into developing a BuddyPress theme from scratch, and soon gave up on the idea. It’s terrifying. If you really want to customise the look & feel, do it as a Child Theme. The fate of any BuddyPress is dictated by the momentum it builds (or fails to build). The site, or more accurately its membership, needs to provide good enough reason for people to come back regularly, and contribute while they’re there. I wish them well. We’ve got a BuddyPress-based government project of our own in the works; the development work is close to completion, but we’re facing a few bureaucratic hurdles. I’m hoping for progress in the next couple of weeks; naturally, I’ll blog about it in due course. Consistency of government departments’ visual identity has been on the cards for quite some time. In such austere times it’s increasingly indefensible not to; it’s how the citizen sees it anyway; and there’s evidence, from home and abroad, that it can be beneficial. I blogged back in 2010 that, with a new government taking power, it was an idea whose time had come; and the Single Government Domain project was always likely to be the trigger. A couple of months back, I received a tipoff that the new logo style had been agreed; and that departments were starting to factor it into future comms plans – but I didn’t want to blog about it until the details were made public. Looking through the GDS Github account this morning, I came across a publicly accessible PDF file entitled ‘HMG Identity System’, carrying Cabinet Office branding, dated January 2012, and uploaded in the last fortnight. It confirms the tipoffs I had received. 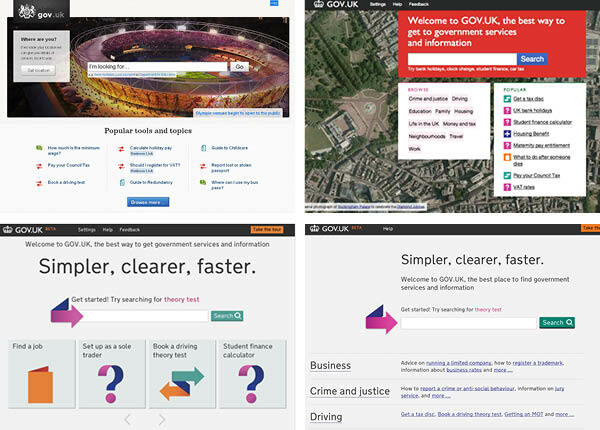 If you’ve been following the evolution of the gov.uk project, it won’t come as much surprise to learn that each department gets a single identifying colour. (Health get two – one of which is NHS Blue.) For the most part, the colours will be broadly familiar from existing departmental palettes: Education’s orange is the most striking exception. Departments’ sub-agencies will also fall into the same system, and will inherit the colour of their parent department. There will also be ‘auxiliary icons’ for use in certain circumstances: the crown as seen already atop gov.uk, and a somewhat unpleasantly squared-off Union Jack. The document says it can be used in either portrait or landscape orientation, but there’s no indication of how it will handle extra-long names such as Defra’s. It’s very simple, surprisingly so in fact. The choice of typeface – Helvetica Neue, I assume? – doesn’t immediately say British, in the way that Gill Sans might have done. It’ll be very easy to forge; and, I fear, very easy for arms-length bodies to get wrong. But purely subjectively, I do quite like it. The ‘new look’ is in fact already ‘out there’, if you know where to look. I’ve had it confirmed by the Dept for Education that they’ve been using it on their website since ‘the start of April’, making them the first dept to do so. However, implementation is patchy: the ‘old’ DfE identity is still in evidence: I’m seeing an old logo as their website’s favicon; on their Facebook page; and despite their claims to have changed it, as their Twitter icon and profile background. There’s also photographic evidence of the new style in use by the Teaching Agency, a DfE executive agency. I haven’t yet found evidence of any other departments using it yet. If you have, do please leave a comment. Canada and Germany have had consistent departmental identities for ages. France adopted a common logo (Marianne) in 1999, but its application is somewhat variable. The introduction of a consistent NHS identity was exemplary: 95% of people now recognise it spontaneously. This website explains what they did, and why. The departments of the Northern Ireland Executive share a common visual identity (hexagon-based logo and typeface): but the website about it seems to have been rationalised. The Scottish government doesn’t appear to have any kind of identity for its Directorates… which I guess is consistency of another kind.